Riding on today’s fourth wave of feminism, the idea of having a “girl crush” is something that’s become wildly popular in recent years. Just from Twitter alone I’m reminded through every #WCW (Woman Crush Wednesday) of who my fellow females look up to: Maggie Cheung, Kiko Mizuhara, Susan Sontag, Emma Watson, Michelle Obama, etc. The list goes on and on. What unites the candidates is the veneration women have for them, or the desire to wield the same awe-inspiring combination of intelligence/beauty/badassery their girl crushes already possess. These girl crushes are also females in power: accomplished ladies who are so skilled they’re at the top of their fields. We like to think of them as chic and fearless in their ambitions. In K-pop, they’ve traditionally been represented by groups like 2NE1, 4minute and f(x) – unconventional artists that managed to capture a female audience by not appealing to viewers in an overly sexual or cutesy manner. Instead, through a combination of edgier electronic music, avant-garde fashion, and power anthem lyrics (“I AM THE BEST”), they gave us an alternate vision of womanhood to look up to. Yet as much of K-pop’s old guard disbands, there’s been a vacuum of girl crush groups being slowly filled by new artists like Black Pink. G-Friend has also attempted to take up this mantle with their latest “Fingertip” MV, initiating a “girl crush” concept change from their previous theme of innocent schoolgirls. If the G-Friend of “Rough” and “Me Gustas Tu” played up the naiveté of youth, twirling in cotton skirts and white ankle socks, the G-Friend of “Fingertip” is an attempt to show members who are now independent women of note. This arrival of change was first teased to us with photographs of G-Friend in black knee-length socks and soldier-inspired outfits. It’s a rather tepid look for a concept meant to inspire women; it’s also a messy cliché that’s been used by girl groups countless times in the past. While dressing a woman in army-accented clothes and handing them guns for an interstellar battle royale naturally evokes the symbolism of the military power (as well as traditionally masculine violence), assuming such imagery signals feminine strength is a mistake that K-pop continues to make. In the end what G-Friend is wearing is high-waisted shorts with peplum tops and flowy blouses. They’re trendy clothes any teenager might pick up at Forever 21, for looking cute while playing laser tag at a BFF’s birthday party. 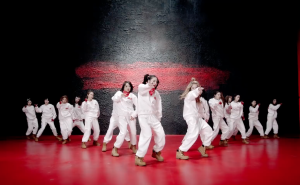 This is particularly boring when considering how Cube Entertainment was unafraid to put 4minute – even Hyuna – in baggy, all-white jumpsuits and Timberland boots for “Hate.” There were also Minzy’s strange hat sculptures and Dara’s Dr. Seuss hair in “Lollipop,” and f(x)’s pastel hippie-flare pants from “4 Walls.” While these styling choices may have been been questionable at worst, in some sense it didn’t matter how strange our girl crushes looked. These clothing decisions were a statement about freedom and originality, meant to attract the admiration of other women as they dressed outside the box, without courting the male gaze. G-Friend’s inability to truly evolve sartorially makes it seem as though “Fingertip” is trying to have it both ways: they want to retain the male fans gained from the schoolgirl era by playing safe in fashion, while still attracting a new female audience through a mature, girl crush twist. But the change that manages to occur – namely, the members’ arbitrary one-eighty from girl to woman – reminds us just how unnatural K-pop can be when it is catering to a predominantly male fan base. To men, the magic of the female makeover is completely believable; it’s women who understand how much sweat, blood and tears such transformation requires. Because we know intimately that beauty is work, especially during puberty — it’s the money spent on awkwardly padded bras and Accutane, the time spent shaving armpit hair and tweezing eyebrows, the sad steamed vegetables eaten to slow burgeoning hips and thighs. Most men have little interest in these truths. They are content to enjoy productions that mirror their fantastical conceptions of women, and so what we get with “Fingertip” is a continuation of images pandering to men. Dressed in run-of-the-mill idol outfits, the ladies of G-Friend only pay lip service to the myth of females as flawless creatures, able to achieve transmutation from child to adult effortlessly. Such falsehood certainly deserves no attention from young women in search of a path to follow. In this sense there are no girl crushes or role models here; only bodies, directed and displayed in the interests of men. What G-Friend’s shallow take on the “girl crush” concept shows is how feminism has become a trend to be co-opted for its current relevance. It’s the industry’s attempt to get more women to notice basic girl groups, even as they offer empty concepts devoid of empowerment. But who says it has to be this way? If there’s anything K-pop knows, it’s that netizens have the power to complain, to withhold their purchasing power, to demand better of their faves. And that is exactly what this essay is meant to be – a plea for companies to take this concept more seriously, and show female fans more artists we can proudly stan with our wallets and light sticks. Here’s one woman who is still waiting for a new K-pop girl crush to become her latest #WCW.